Zabamat is the northwestern coastal region of Stonefalls. 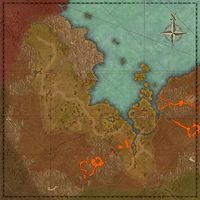 The city of Ebonheart occupies the large island on the eastern side of the region. The town of Lukiul Uxith is found in the west, between Fort Virak in the north and Heimlyn Keep in the south. The Zabamat Dolmen is just to the east of Fort Virak. The pass to The Rift is found in the northeast corner. The Varanis region borders to the south and west, while Daen Seeth is to the east. A Bit of Sport: Impress Nord sawyers by fighting them drunk. Cleansing the Past: Help put the dead to rest at Vivec's Antlers. The Curse of Heimlyn Keep: Help save the scholars of the Keep from an ancient curse. Enlightenment Needs Salt: Aid an Argonian alchemist in her attempts to join the Mages Guild. Hunting Invaders: Help an Argonian village repel a Covenant assault. Night of the Soul: Help a Temple disciple regain his faith. Peril at the Pools: Locate the farmers who were displaced by the Covenant invasion. Recovering the Guar: Locate the guar that ran away during the Covenant attack. Restoring Order: Help the governing house of Ebonheart unite the disparate citizens. The Sapling: Help save the Argonian's Hist tree in Ebonheart. A Storm Broken: Search for a missing resident of Lukiul Uxith. Taking the Tower: Collaborate on another wine-related "business venture". What Was Done Must Be Undone: Enter the Reliquary and end the curse of Heimlyn Keep. A Noble Guest: Steal away the "king's betrothed" to join his feast. The General's Demise 5 Save General Serien and stop the Covenant invasion of Stonefalls. This page was last modified on 10 May 2017, at 11:42.